Slick, sophisticated and fun loving, Baden-Württemberg’s capital is a zingy modern city with a small-town soul. The locals might be known for their snappy dressing and their passion for fast cars (Mercedes Benz and Porsche both have headquarters here), but you’re just as likely to find them hiking in the surrounding Schwäbische Alb or relaxing in a hot mineral spring as you are living it up in an overpriced nightclub. The city’s core was decimated by bombing raids during WWII and today the few remaining classical buildings are hemmed around by office blocks. Still, Stuttgart has a lively arts scene and is gradually establishing itself as a top destination for performing arts connoisseurs. World-class opera, ballet and live music performances run almost nightly, and tickets are priced to be affordable. Good food, fine wine and revelry are integral to the Stuttgarter ethos. Traditional Swabian eateries serving scrumptious but artery-clogging cuisine rub shoulders with modern, Michelin-star restaurants and bustling farmers’ markets. Festivals run throughout the year and range from a vast September wine extravaganza to the food and music-focused Stuttgart Summer Festival. The nightlife scene raves on year-round, with the best bars and clubs focused around the lively Theodor-Heuss-Strasse. 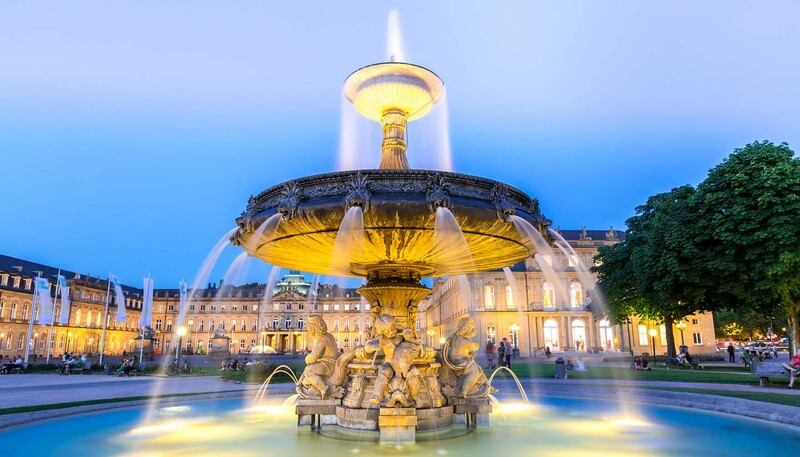 Stuttgart has something of a south European feel, particularly over the summer months when people gravitate to the city’s green expanses. A string of parks and gardens dotted with beer gardens and restaurants slices through the central districts in an enormous ‘green U’, starting at the Schlossgarten and ending in Killesberg Park. If the two-hour ramble from one end of das Grüne U to the other doesn’t sate your enthusiasm for fresh air, the surrounding vine-laced hills are home to a scenic network of hiking and biking trails. Relaxing in a natural hot spring is high on the list of must-do Stuttgart activities. The city’s Bad Canstatt district has some of the best mineral spas in Europe, and the rolling hills of the Stuttgarter Kessel are dotted with holistic treatment centres. Venture further afield to discover the Black Forest, the fairytale castles of Ludwigsburg and the stalactite-hung caves of the Schwäbische Alb.